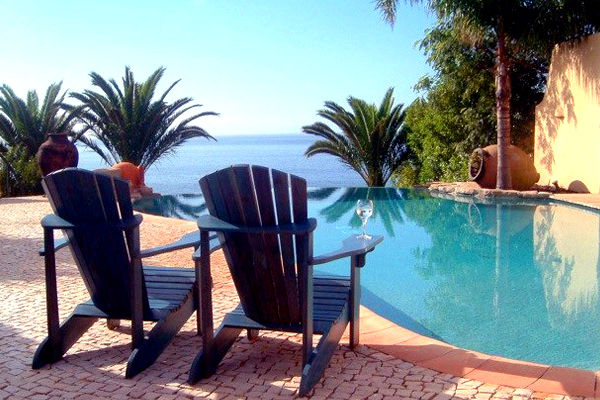 Casa Suhaili is a luxurious villa in Praia da Luz, with a beautiful private swimming pool and dazzling sea views. The property is a detached privately owned villa set in 3000 sqm of gardens, located approximately 80 m away from the sea and with direct access to the waterfront through the garden. There are 4 bedrooms in total. Two have king size beds and two with single beds (2 in each). All four of them have their own en-suite bathrooms. The large living room has a lovely fireplace and a flat screen TV with satellite channels. Free Wi-Fi internet access is also available. Off the living room there is a separate dining room with a large table and chairs with seating for eight people and leads onto the modern and fully-equipped kitchen with a built-in laundry room. The pool is a level deck saltwater chlorinated infinity pool. Outdoor, there is a large timber decked shaded dining and barbecue area. There are also hammocks and a Bali, where you can relax and enjoy the amazing sea views. On weekdays, the housekeeper provides exceptional non-intrusive housekeeping services and the gardener is on call and keeps the garden in perfect condition. The villa has been owned by the same family for over 20 years and is in perfect condition. Quiet and secluded yet, the villa is located only within a few minutes’ walk to Praia da Luz beach, supermarkets, restaurants, bars and all other services. A great place to get away from the hustle and bustle of the Summer. - Beach Walking Distance: 10 Mins.